Our reviewers present their Top Ten discs from the past year. Among the artists that show up on multiple lists are Charles Wilson, Tommy Castro, John Nemeth, Darrell Nulisch, The Insomniacs, Candye Kane, and more. All of the lists can be found in our Pick Hit section. 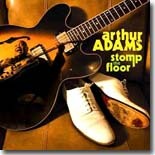 Blues veteran Arthur Adams continues his nearly 50-year recording career with Stomp The Floor, our Surprise feature this month. This month's Flashback takes a look at On The Prowl, a collection of recordings from Walter "Wolfman" Washington's first three Rounder albums. Our What's New section features new releases from Percy Sledge, Kellie Rucker, Little Joe McLerran, Delta Moon, Tino Gonzalez, Memphis teenager Will Tucker, David Ducharme-Jones, and more.